Clover Station is the do-everything POS built for retail. Track inventory, manage employees, build stronger customer relationships, and accept payments — easier than ever before. 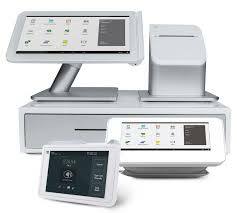 Clover Point of Sale systems provide your business with a state of the art countertop POS device. Right out of the box you can take payments, track inventory, manage time sheets, run reports, and print from its connectivity hub. A snap to set up and customize, Clover’s software meets the needs of your business by adding features from the Clover App Store. Clover Station is designed for fast, secure and reliable transactions with each swipe, dip or tap. Clover Station is a great payment solution for retail stores, restaurants, and businesses with physical locations. Touchscreen display, a high-speed printer (which doubles as a power and connectivity hub), and a cash drawer. Proprietary pivot arm swivels smoothly between merchant and customer. End-to-end encryption, data tokenization, and hardware designed exclusively for payments processing. Embedded high-resolution camera that can be used for barcode or QR code scanning. Access to Clover App Market with apps designed to help you sell more and run your business better. FD40 included, enables PIN-based debit transactions, EMV® chip cards, and contactless payment transactions such as Apple Pay, Android Pay, and Samsung Pay. Comprehensive point-of-sale payment solution with swivel touchscreen, printer and cash drawer. Business apps to help your business run more efficiently. Streamline order taking by linking it to additional printers or screens in the kitchen or office. TransArmor® Data Protection helps protect your card data if your system is breached. Accept payments even when your internet is weak or down. Cloud-based system with real-time reporting to analyze your business performance. Manage all aspects of your business, from employees to inventory and returns, with advanced software and specialized apps available in the Clover App Market. Tap into valuable insights about your customers, what they buy and your business, so you can grow your business faster. Homebase is the only tool you need to manage your team. Track employee hours, build schedules instantly online so your team can view and swap shifts, and much more to make your life easier. The Gift Cards app offers a simple and costeffective gift card program to easily sell digital and plastic gift cards, and issue store credit straight from your Clover device. Get a handle on your business analytics using data from every transaction. Discover trends and easy-to-understand insights that can help boost sales, plus see how well other quick service restaurants are doing nearby. Keep track of payment details, date and hour trends, payments per employee, customers, tender and more, while generating multidimensional analyses for your business. Collect customer info through Clover and feed it automatically into your Constant Contact email marketing program. Completely automate your email marketing! Send your customers automatic thank you emails and more! Built to withstand the heat and humidity of the kitchen, this fast, two-color printer offers crisp, easy to read type for quick viewing. This is the only kitchen printer compatible with Clover. Virtually any 1D barcode can be captured – including the typical barcodes that are printed on paper labels; electronic barcodes displayed on the screen of a mobile phone, tablet or computer. The CAS SW-RS Series is perfect for Frozen yogurt shops and other merchants who sell their wares by weight can speed up checkout. This scale supports up to 20lbs, switches easily between grams and ounces, and automatically passes weight information into Clover for a quick and accurate checkout process. Connect With One Of Our Solution Experts Today For A Custom Quote!